A Disruptor in the Mold Industry? What, why and how we do what we do. The Mold Solutions Group’s Crawlspace Monitoring Program is an innovative service that will take some of the guesswork out of what’s going on in your crawlspace. We are offering three levels of service that are designed to help you sleep at night! The Bronze, Silver and Gold plans are designed to give you the service you need to take charge of your home…from the bottom up. The Crawlspace door: Is it in good shape (hinges, latches, wood, etc.)? Does it seal properly? The crawlspace access door is your first line of defense against undesirable animals gaining entry to underneath your home. Yikes! Fungal Growth: Any sign of fungal growth can be quickly nipped in the bud before it gets a chance to become an issue. Fungal growth is a sure sign that your crawlspace has a moisture problem. Insulation condition: Hanging insulation can mean excess condensation is occurring in your crawlspace. We also look for signs of rodents nesting in your warm insulation. Humidity Levels: Humidity control is key to keeping troublesome fungal growth at bay. Water Staining: Staining on your foundation walls from water/moisture is a sure sign of bigger issues. Block and brick are NOT impervious to water penetration; moisture can make its way into your crawlspace. Is the water around your home being controlled? We will let you know. Obvious Leaks from Systems: Leaks can become a headache if they are not caught. Not only do leaks create unwanted moisture in a crawlspace, they cost you money…now. Plumbing lines, water heaters and HVAC units can all create unwanted moisture issues. Catch them quickly and have them addressed before your wallet starts dripping! Unknown Leaks: Plumbing systems and fixtures are prone to failure. We will check around known plumbing systems (kitchens, bathrooms etc.) for water staining on the subfloor. A problem, if undetected from above, will usually show up here…but may be hidden behind the insulation. Find out before major work needs to be done! Ductwork: Your ductwork is a major contributor to what you may be experiencing in your home. A leaky seam/connection can allow “dirty” crawlspace air to be pulled into the duct from the crawlspace as the “clean” air travels through as it heats or cools your home. Bleh! We also inspect for compromised duct insulation and age decomposition. Moisture Levels: Moisture readings will be taken in your wooden floor system. Elevated levels indicate a problem. Potential Hazards: Rodents are notorious for wreaking havoc in a home. They will chew wires, plastic, ductwork…whatever they can sink their teeth into. They also leave a mess that is potentially hazardous to humans. Not to mention the fact that they will scare you to death if you come across one! Service technicians are people we like to trust to do their job competently but they sometimes get in a hurry. Did they put everything back where it goes? For instance: All of us have gotten our oil changed, right? We like to trust them as the “experts” because changing oil is what they do all day. How many people do we know who have said, “They forgot to put my oil cap back on!” The same applies to your home. You need to be able to trust that the work is complete. Has your vapor become compromised due to someone crawling across it? Did the cover get re-installed on that junction box? Did they clean up after themselves or leave debris lying about? 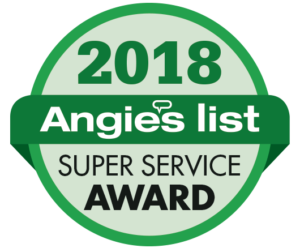 Angie’s List Super Service Award – 6th year in a row!